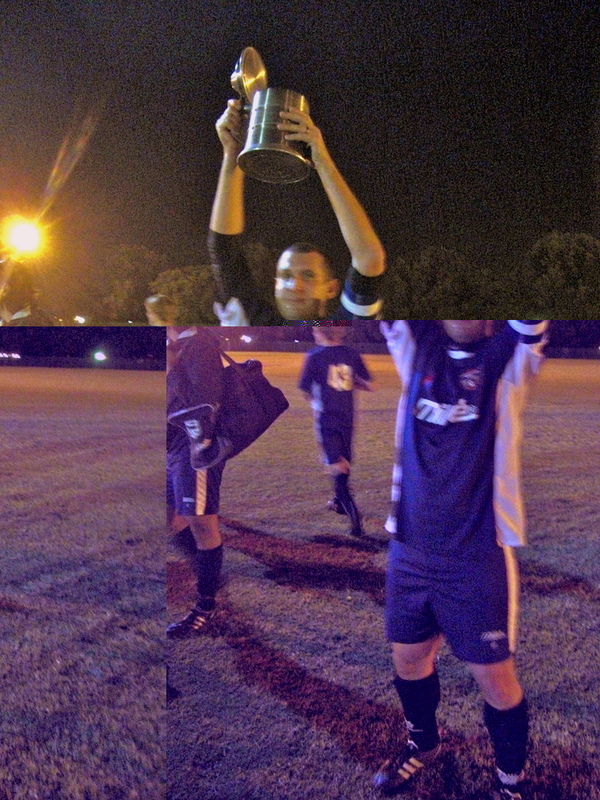 Yes, I've done it again: after a shortened season because of the World Cup, I added some silverware with a League Victory with Panorama F.C. Ok, it has happened once again. After a very successfully season at Panorama F.C., we managed to keep our focus until the end and we won the League. After the massively disappointment end of the season of last year , when we lost at home in the last round only to see the other team celebrating their unexpected league triumph on our field, I got my personal revenge. And this time I was the captain. 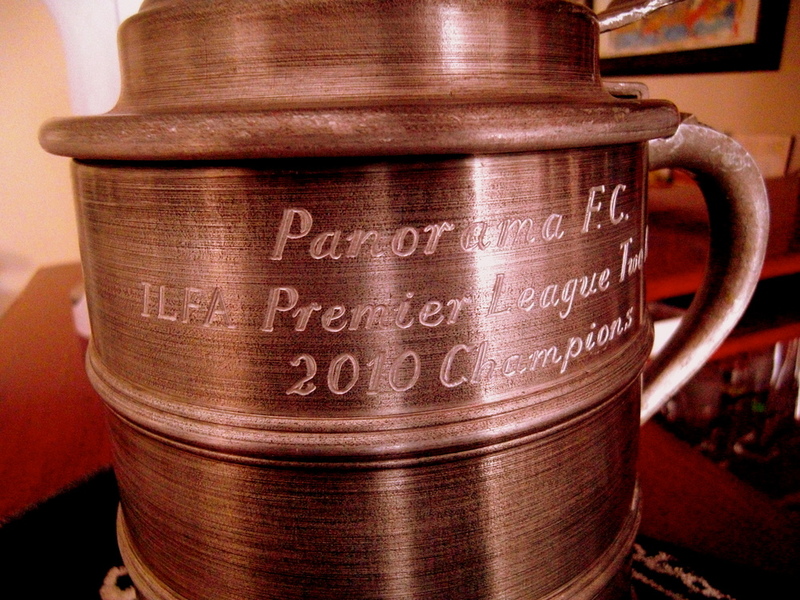 I must admit that in three years I enjoyed quite a bit of success at Panorama:the League Cup in 2008 , a promotion (even if finishing second was awful) in 2009 and a League title in 2010. 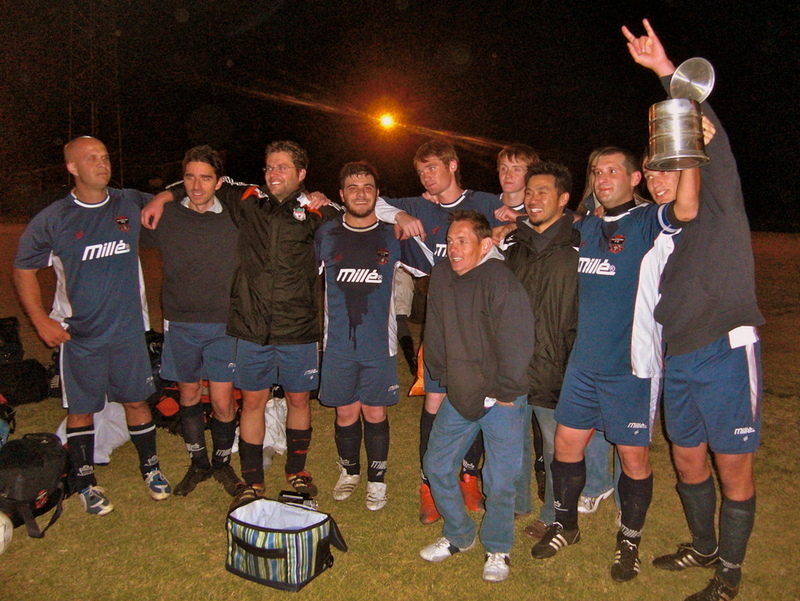 Winning the league, even in a crazily shortened season like this one is south Africa (the usual March to September calendar has been compressed to a crazy March to May to accommodate the World Cup, since most of the teams are staying in our region -Gauteng- and are using the football facilities in the area for training and friendly matches) is always an achievement. Unlike a cup, when with some luck in the draw and one game per round you can somehow overachieve, the league awards only the teams that are consistently performing over all the rounds. And this year, from the start, this has been the case. After spending 2-3 games finding our best formation, we went to win 9 games in a row before dropping some points away. But after winning 3 of our last 4 games with high scores (9-0, 8-0 and 5-0, with the only loss of the season in between), we finished at the top, with the best attack, the best defence and the best goal difference by far. And so memories go back to the first and last time I won the league. It was in 2003 and it was with Parsons Green in my London days. I was a totally different player back then. I was quicker, I was leaner, and I was younger. I was playing left back in a position that taught me to use my often forgotten left foot to the extent that now I can easily play with both feet. I couldn't get easily injured and if I got a nasty hit all I had to do was simply put some ice, drink some Guinness and be ready for the next training sessions 3 days later. The London league also added an extra layer of aggression to my totally different Italian game. I played like an Englishman and I was proud to be part of a team that for some years was probably one of the best at that level in the area. Now I look myself at the mirror and I see a totally different player. Less quick, less lean, almost too heavy for my already stocky frame, and prone to injuries that require weeks of physiotherapist sessions and rest that never really happens. I play defensive central midfield (my favourite role) and I'm maybe more aware of what happens around me and how to make the ball work for me. 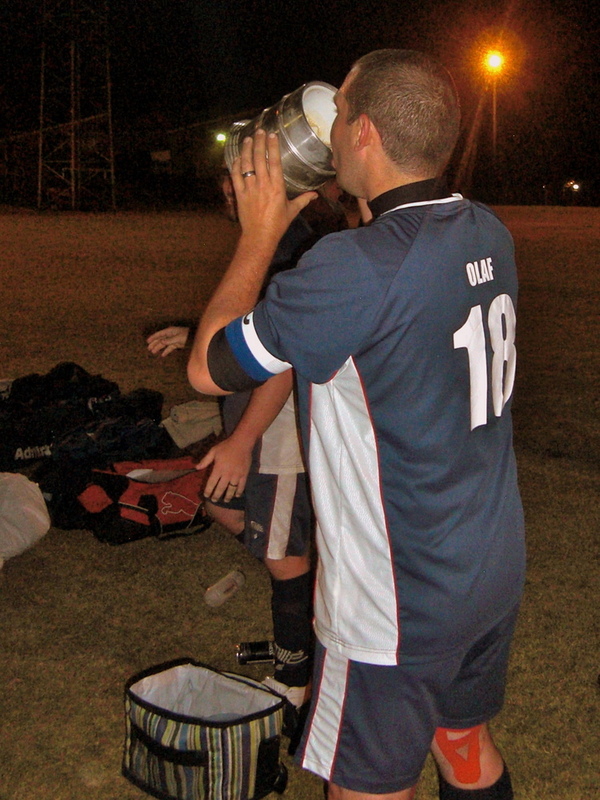 I'm one of the oldest of a team full on players in the early 20's (or even still at school), and I'm the captain. Maybe becoming the captain gave me some extra motivation to simply keep playing with a lot of strapping on and tried to enjoy the tournament. I had to talk, to shout, to command and , to a certain extent, I liked it (not sure if my team mates enjoyed having me shouting orders on the field, but someone has to do that job). I was lucky enough this season to have a fantastic coach, who tried hard to keep us interested in training by introducing exercises that I've personally never seen in many years of football, and to had a psychological layer to our sessions. And my team was simply fantastic. A great mixture of youngsters way more mature that their age that gelled perfectly with the older guys, experienced players to create a lethal cocktail of extreme physicality (I think most of the team we played still have nightmares about our midfield) and speed, provided by those teenagers that can simply go up and down forever. And so, with the victories and the goals came some pressure from a club that hasn't seen a league triumph in almost 8 years. We probably played really bad only 2 games, for different reason (a 2-2 with Dra Peace where we scored all the goals, including 2 own goals, and a 1-2 defeat at Dainfern when we got too nervous). But nothing matters anymore. By winning 5-0 against Randburg in our last game we sealed the league with 13 victories in 16 games (2 draws and 1 loss), and, best of all, I could celebrate surrounded by my team with the captain's armband, while Lindsey, mu beautiful wife, earlier still a bit worried about what would happen if I'd lose again (last year it was a disaster), was taking pictures and joining in with the rest of the team for a final celebratory drink in the pub. 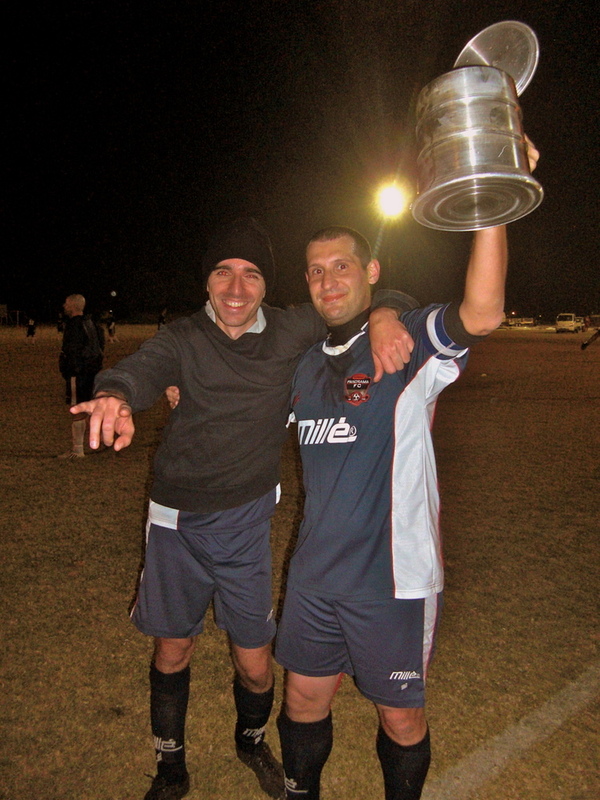 So, before the world cup starts, I have a reason to celebrate and again getting a bit nostalgic about my past years playing football around the globe, from Italy to South Africa via London. Now I just hope that, the 11th of July, another Italian will join me into the celebration, by lifting a cup in Soccer City at the final act of the world cup.